Karma coming back around? Sandy-hit NYC resembles NATO-destroyed Libyan city of Sirte – Ila el amam! October 31, 2012 – While the hurricane Sandy caused destruction currently blows most other news off of the global media’s front pages, the destruction of the Libyan town of Sirte has gone largely unreported by the same media. A reader however pointed out to me that a photo of the NATO-destroyed hometown of Muammar Gaddafi shows surprising similarities with a photo of destroyed homes and businesses in the Rockaway section of the Queens borough of New York City which was hit by Sandy. Sirte, a coastal town of around 100,000 residents, once was considered to be the center of urban development in Libya but became the target of NATO and its “revolutionary Libyan rebels” soon after the so-called fall of Tripoli in August 2011, not in the least because of its imperturbable loyalty to Muammar Gaddafi and the Jamahiriya government. 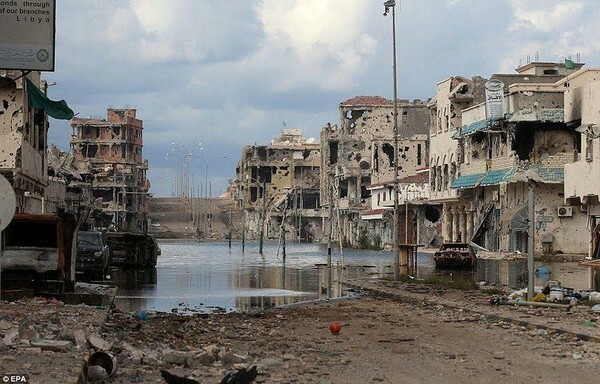 After weeks of siege and horrifying war crimes committed by NATO and the rebels in the Orwellian version of “protecting civilians”, Sirte’s inhabitants turned into homeless refugees and the city was named the modern day Stalingrad. The results of the criminal NATO attacks carried out under United Nations mandate – the same United Nations that prepared to bestow an award on Muammar Gaddafi for its achievements in the area of human rights months before the start of the Western war on Libya – are shown in the second photo below. Fasting forward to today, we find one of the main orchestrators of the Libyan war being hit and partially destroyed by what to the eye appears to be a random whim of Mother Nature. National news networks warn that the upcoming elections could be directly affected because of the devastation and independent analysts for cogent reasons label the so-called Frankenstorm a “HAARP and Aerosol geoengineered hurricane“. Meanwhile the consequences of both destructions are ultimately the same: innocent civilians lost their homes and businesses and were either forced to flee their country from the occupying forces (Libya) or likely will be forced to leave their destroyed properties to be put in densely packed “civilian buildings” in order to hasten the process of Agenda 21 (U.S.). I am no prophet, neither do I want to claim that the Higher Power directly punished the U.S. for its crimes committed in Libya by somehow demanding a destructive hurricane to do what it did and to cause what it caused. I simply want you to look around and read the signs. If you in some way have been participating in the imperialist war on Libya or if you still contribute to other imperialist activities and wars, e.g. by spreading propaganda or even by having chosen to be silent and to rest your case because you considered it to be none of your business, it may be about time to desist. Hands off Libya, hands off Syria, hands off Iran. Don’t mess with Karma and thou shalt not be messed with.